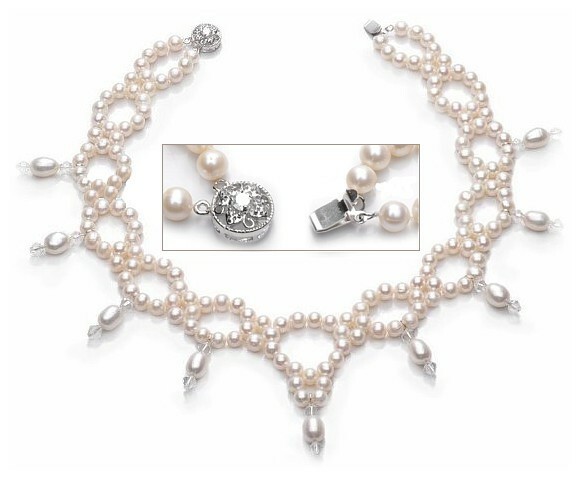 This absolutely divine freshwater pearl necklace sits like a beautiful pearl lace collar at the base of the neck. The design takes the shape of a large 6mm freshwater pearl "chain", from which dangle larger oval rice pearls, bordered at either end by Swarovski crystals. In the centre is a slightly more ornate section, and the push-in clasp is an elegant circle embellished with a Swarovski-crystal-studded daisy. Size: 44.5cms (17"). Width of pearl chain 2cm (1"). Chain + drops: 5.5cm (2¼"). Centrepiece: 6cm (2½").